Seamlessly interweaving archival war footage and a fictional narrative, Stuart Cooper's immersive account of one twenty-year-old's journey from basic training to the front lines of D-day brings all the terrors and isolation of war to life with jolting authenticity. Overlord, impressionistically shot by Stanley Kubrick's longtime cinematographer John Alcott, is both a document of World War II and a dreamlike meditation on man's smallness in a large, incomprehensible machine. Its complexly-layered pastiche—combining elements of poetic realism, documentary, arthouse experimentation and classical cinema—results in a liveliness that make it endlessly fascinating, never allowing itself to be pigeonholed or reduced to a polemic. The fault lines that arise when these approaches collide lend it a bracing quality that few films retain. A young Brit gets caught up in and chewed up by the Nazi-killing war machine in this documentary-style drama. Cooper intersperses found footage with his dramatic scenes, succeeding in giving the film a distinct sense of time and place. Cooper often lets his pictures do the talking, going for long stretches without, or with mere snatches of dialogue. This choice effectively heightens the tension inherent in the situation, leaving the film a surprisingly ambivalent portrait of the war effort. Jun 01, 2014 Bryan C.
A dramatic tale interwoven with extraordinary (and bone-chilling) raw footage. May be scrutinized alongside Full Metal Jacket, both "man-in-the-machine" films dwelling at some length on the transformation from civilian to soldier. But unlike Kubrick's film, Overlord lacks any biting irony or satirical edge that might skew it towards anti-war cinema. Cooper's film is more modest and less political than its Vietnam era contemporaries, a delicate character piece in avant-garde docudramatic form, fact and fiction synchronized into poetic realism. Aug 22, 2013 Simon M.
Was expecting a unique and poetic war film, which it certainly was, and found myself with a brilliant one. I loved it. 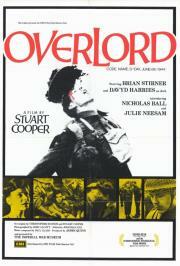 Cooper's film is an impressionistic look at war, one that strikes an unusual and haunting tone. John Alcott's cinematography blends seamlessly with archival footage, to the point where you often can't tell what's new and what came from the vaults. I liked this one a lot, but I thought it could have edged a little bit closer to the avant-garde. The flash-forwards, fantasies, and the beautiful letter-writing scene were the highlights. Largely forgettable, except for the fantastic scene of Tom shyly meeting "The Girl" and the hopes of something to come after the war.